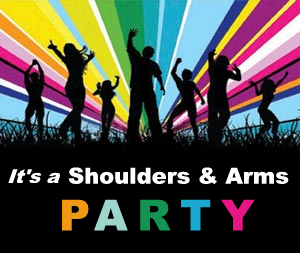 As I was completing the Shoulders & Arms routine yesterday, I had the opportunity to hear Tony Horton exclaim yet again: It’s a Shoulders and Arms Party! This is my fifth week of Shoulders and Arms this round. I’ve kept the weights and reps the same throughout. Never have I considered it even remotely festive. It’s a good routine, but my body continues to break down as this 90 day round progresses. Along with my tennis elbow, my left shoulder has been sore for several weeks now, making those Arnold Presses difficult as the sets accumulate. I was also complaining about my lower back aching during my tour of Zoo Atlanta. One of my more observant readers– a multi-round P90X veteran and oenophile–suggested that he believes this is due to the cumulative ab workouts associated with P90X & X2. And that the lower back is not developed to the same extent as the abs, thus compromising spinal stability. It’s a good theory. I feel that my core and abs are well developed at this point, and I agree there is less focus on the lower back. So this week, I’ve been skipping the ab ripper workouts and working on some lower back moves with the stability ball, the dreaded “Superman” pose, and holding warrior 3 longer. As a result, I definitely feel my lower back is getting more attention. What else? Well, since I’m bitching about aches and pains. I’ve gone this entire round with a pain in my Achilles tendon at the back of the heel when stretching in downward dog. Reading around, I see this is yet another common ailment with runners. And while I am not a runner, I seem to be increasingly afflicted with runner related ailments. It seems it can come from over stretching or straining of the tendon, falling arches and my nemesis overly tight leg muscles. What have I been doing about it? Not much, until now. Going forward, I plan to get some insoles with better arch support and stop fully stretching my left leg while in downward dog and similar positions. My hope is that all this connective tissue unhappiness will ease up after I complete this round and I take a few weeks off. Day 60, by the way. A milestone. This entry was posted in P90X2, Round 6 and tagged Chest + Back + Balance, Milestones, P90X2, Pain, plyocide, Rest, Shoulders & Arms, Tonyisms. Bookmark the permalink.